Luxurious, yet accessible, Svaja Glass exemplifies modern and contemporary style complemented by time honoured techniques and traditions. Svaja elevates glass to a plane that makes it truly unforgettable to experience giving and receiving, the contrast of colours and organic shapes falling harmoniously into luxurious piece of art to create long lasting and positive impressions! Water and desert: an unusual combination, but one that works so well in Oasis. Drama, twists, turns and mystery: our Arabian Nights glass collection reflects it all. Drama, twists, turns and mystery: our Ocean Tall glass collection reflects it all. Our stunning collections of art glass vases, with a range of styles reflecting the best of modern and contemporary style complemented by time honoured techniques and traditions. Agnes, our glass fish sculpture, is a riot of sophisticated colour caught within clear Baltic glass. Between the shallow lagoons and sheltered reefs, swims a small, yet super-fast Clara Clown Fish. This is the life aquatic. Exotic and with a flamboyant twist, Annie Angel Fish is one of our best-selling glass animal sculptures. 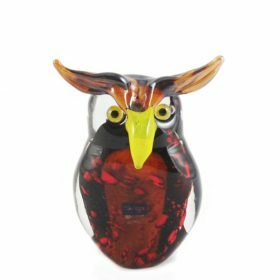 Bold, vibrant sophistication, luxury and exceptional quality sum up Svaja's ethos and this is exemplified in our stunning collections of art glass animal sculptures. We present a wide range of your favourite animals and birds in a range of styles reflecting the best of modern and contemporary style, complemented by time honoured techniques and traditions. All hand-crafted in our studios, our animals are unique hand-made designs where the contrast of colours and organic shapes fall harmoniously into luxurious pieces of art to create long lasting and positive impressions. I would like to confirm that I have today received the original ordered Hourglass Ruby. Can I just say it is the most beautiful thing I have ever ordered, and had the delight to open. The people I am gifting this for Christmas will be as delighted as I am, I am quite sure of that. I thank you for sorting the problem so quickly for me, and for remembering to send the additional box.